Superior, Wis.-based Fraser Shipyards is building a new 140’x38’6″, 26-car ferry for Miller Boat Line. The company operates ferries that run from northern Ohio’s Catawba Island Township to South Bass Island and Middle Bass Island, two of Lake Erie’s most popular recreation destinations. The new all-steel ferry will be named the Mary Ann Market, in honor of the late matriarch of the family that owns Miller Boat Line. 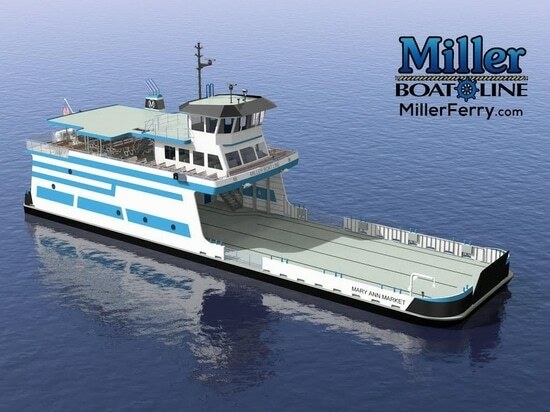 The ferry will have drive-on-drive-off capability and will join Miller Boat Line’s four other ferries. “We have a long tradition of building Great Lakes vessels at Fraser, including car ferries. We are proud to be Miller Boat Line’s partner. We look forward to delivering a modern vessel that meets all of their needs,” James Farkas, president of Fraser Industries Inc., the parent company of Fraser Shipyards, said in a statement announcing the contract. 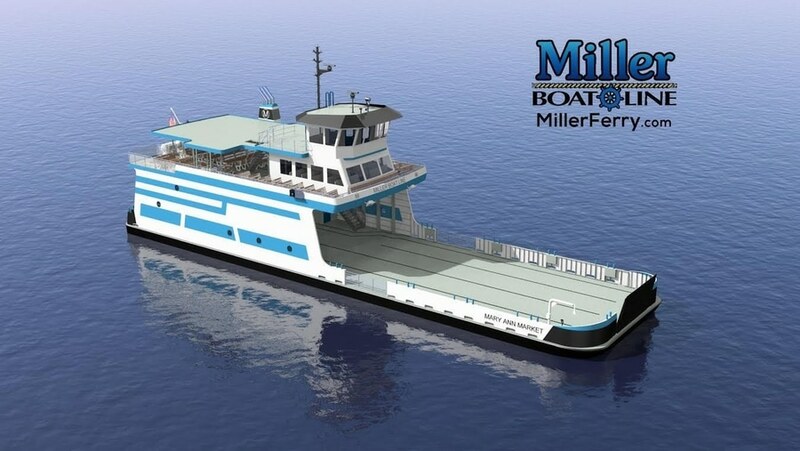 The ferry will have enhanced propulsion and maneuverability, a fully accessible main deck cabin and restroom and the ability to carry 20% more cargo than Miller Boat’s largest current vessel. Fraser will start building the new ferry this fall in modules, which workers then will assemble. When the new ferry is completed in 2019, Fraser will deliver it from Superior to Put-in-Bay, Ohio. “We chose Fraser due to their enduring high quality, integrity, value and with consideration of recommendations from industry professionals including marine surveyors, lake captains and engineers,” Miller Boat Line president Billy Market said. Founded in 1890, Fraser Shipyards is the last major independent shipyard on the U.S. side of the Great Lakes, shipyard officials said. Fraser has built and repaired vessels for 128 years.